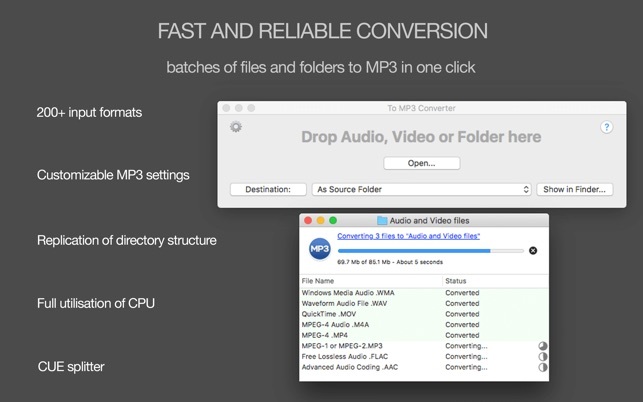 'To MP3 Converter' converts easily and quickly any video and audio formats*, including MP4, VID, FLAC, FLV, WMA, M4A to MP3. Pleasant features like automatic volume adjusting, audio effects, tags and artworks loading, integration with iTunes, CUE splitter, settings customisation**, easy interface and batch processing will allow you to convert your favorite media such as music, clips, video and others to MP3 format quickly and with high quality of output audio. Trial version is available at amvidia.com/to-mp3-converter . To MP3 Converter accepts and processes more than 200 audio and video formats, including but not limited to MP4, VID, FLAC, FLV, WMA, M4A, WAV, AVI, MPG, ASF, MPEG, MPE, MOV, 3GP, M4V, MKV, MOD, OGM, CAF. Please, note: to convert online content you have to download it to your computer first, using a browser or another software. To MP3 Converter allows to convert an unlimited number of files and folders in one click, and supports multiple conversions simultaneously. If you convert a batch of folders, To MP3 Converter will replicate the structure of source folders. It is especially convenient if you need to encode entire music collection to MP3. To start a conversion, just drop files or folders to the app’s window or icon. To MP3 Converter will estimate conversion time, and provide details of the conversion of every source file. You will be informed when conversion of all files is finished. 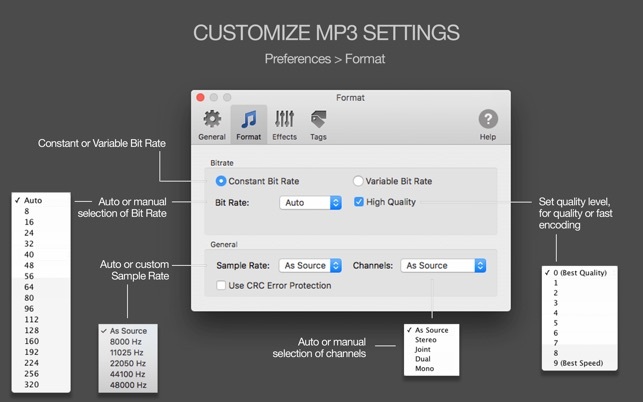 To MP3 Converter estimates Bit Rate, Sample Rate, and Channels automatically, and applies optimal settings to output MP3s. It guarantees the best possible sound quality, saves your time and hard drive space. If you would like to convert to a particular Bit Rate, Channels, etc., just change settings in the Preferences. 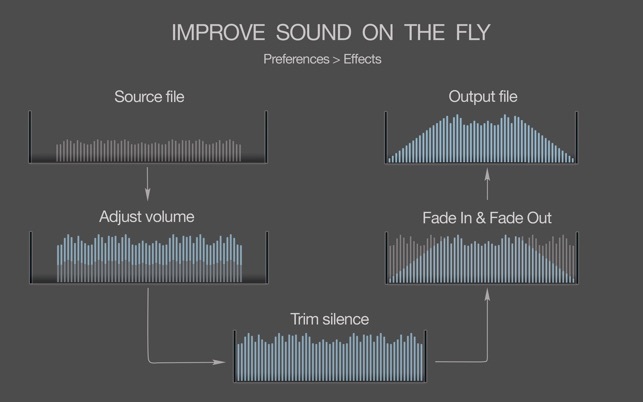 You can customise audio effects to improve quality of output sound: adjust the volume of quiet tracks, trim silence and apply fade in and fade out effects for smooth playback. By default, To MP3 Converter transfers all tags from source files and creates missing tags and artworks based on filenames, paths, and images in local folders. 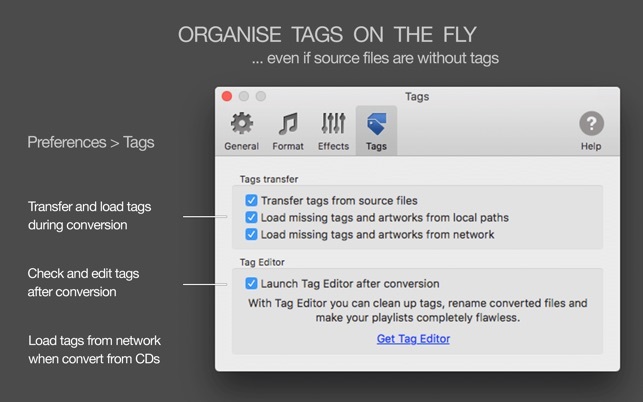 If you would like to organize converted music in a more sophisticated way, or if you convert songs from a CD, we recommend enabling option ‘Load tags and artworks from network’ in Preferences. To MP3 Converter will identify songs by their “fingerprints”, and search correct tags for those songs in online databases, such as MusicBrainz, AcoustID, and CoverArt. To MP3 Converter can split music albums and DJ sets to separate tracks and import tags from CUE file. To split an audio with CUE file, drop the whole folder or just the CUE file to the app. 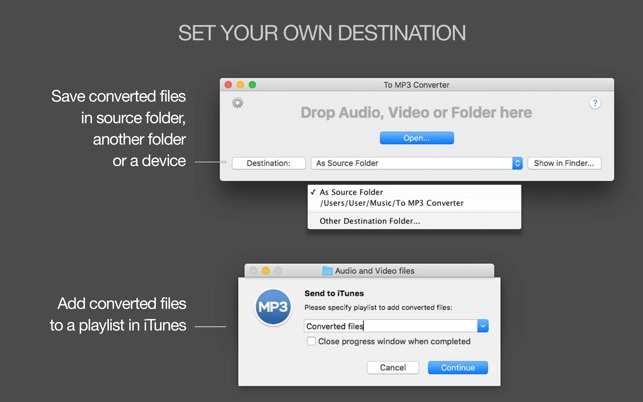 To MP3 Converter allows exporting converted tracks to new or existing iTunes playlists by the quick and easy way. Sometimes movies contain a few audio tracks - such as multi-language tracks, or soundtracks for different playback devices. To MP3 Converter extracts all soundtracks from videos, so you can choose the most suitable one at the end of conversion. To MP3 Converter fully utilizes all CPU cores. Encoding in separate processes makes it reliable and “crash free”. Please, email to sup.amvidia@gmail.com about any problems or feature requests. We always glad to improve our applications for you. If you like “To MP3 Converter”, a review at the App Store would be very appreciated. ** Note: We recommend set Bit Rate at 128 or lower number if you are going to burn MP3 files to CD and use it in your car. Many CD car players may not playback MP3 files with Bit Rates higher than 128 kbps. • Quicker and more precise loading of tags from network services. • Conversion of audio and video with a duration of more than 6 hours. • Better integration with iTunes. • Fixes for the user interface and usability. Schnell und einfach zu bedienen. Und Topp Support!!!!! Das Programm ist einfach und schnell zu bedienen. Jetzt ist auch wieder der Support für die ältere ID3-Tag Unterstützung (ID3v1) dabei. Somit kann man wieder die umgewandelten MP3 Songs im Audi MMI 3G von 2011 auf der internen Festplatte mit den Song-Titeln anzeigen. Die vorherige Version hatte durch den Verzicht auf die ältere ID3-Tag Unterstützung (ID3v1) bei der MP3 Umwandlung auch die Anzeige der Song-Titel verhindert. (In der Vor-Vor-Version gings noch… :-)). Nach Erkennen des Problems bekam ich vom Entwickler eine Vorversion mit der hier beschriebenen Lösung. Topp Support!!! Ich habe ein Tool gesucht, mit dem ich schnell und ohne viel Herumeierei m4a-Dateien in mp3s umwandeln kann. Und genau das tut dieses Programm in einfachster Weise. Man macht ein paar Grundeinstellungen, und dann kann man einfach die betreffenden Dateien auf das Programmfenster ziehen, der Rest geht von selbst. Klar kann man so etwas auch mit kostenlosen Programmen wie z.B. Audacitiy machen, aber nicht so einfach und in nur einem Arbeitsgang wie hier. Super Sache - vielen Dank an den Autor! Ich hatte die Aufgabe für eine Party eine Playlist zusammenzustellen. Verschiedenste Musik-Formate mit teilweise langen Verzögerungen am Beginn und am Ende in unterschiedlichsten Lautstärken lagen mir vor. Kurz gesagt: Den ganzen Ordner per Drag and Drop ins Programm gezogen und Song für Song wurde getrimmt, zu mp3 konvertiert, Pausen entfernt und die Lautstärke angepasst. Über 100 Songs in ca. 10 Minuten! Wer so etwas vorhat: Es gibt nicht besseres!